This has been such a peaceful week for me - back home after a week of traveling, time with good friends (old and new), cooking, and yes, doing a little planning for the New Year. I must admit that goal-setting has been a little bit more challenging for me this year than last (read more here, here, and here). I started off 2013 super motivated and ready to take on my ambitious goals (not that ambitious goals are a bad thing...). That lasted a few months but once summer came around, and the pace of life slowed a little bit, my action-oriented goals felt a little more like things on my ever-present to-do list. By the time fall came and school picked back up, I barely looked at my goals. Granted, I did make progress. A lot of good things happened, in part as a result of setting thoughtful goals at the beginning of the year. But before I set standards and expectations for what I want to see happen in 2014, I want to make sure I spend time reflecting on the things that worked well and the things that didn't work last year. 1. Rest and space on the weekends. This made such a difference for me this year. It gave us something to look forward to each week but I also felt like my working hours were more productive. 2. Setting professional goals. I made significant progress on my degree this year, in part due to some goals I set for myself early in the year. 3. Goal-setting in January. In general, this was a great way to start the year with focus. 4. Blog calendar. I started using this free printable in November and loved it! Thanks, Em! Planning to use it again this year. 5. Monthly duty days. I first read about "duty days" here and loved the idea. Now, I use part of the day the first Friday of each month to catch up on paying bills, depositing checks, and miscellaneous home and business to-dos. 6. Afternoons to work at home. I am such a home-body that taking time to occasionally work from home for part of a day is actually refreshing. I can't and don't really want to work from home all the time right now but every once in a while, it's a good thing. 7. Getting up on time. Yay me! We did fairly well with last year's goal. I'm not much of a morning person but my day always feel more productive when I get a lot done in the morning. 1. Lack of monthly action steps for goals. I lost motivation over the summer when my schedule changed and it was hard to get back on track with my goals come fall. 2. Letting distractions in while working. Especially checking email and social media. 3. Complaining. Especially to people who couldn't help! This is fruitless. 4. Writing on two separate blogs. I decided to do all of my writing on this blog in the coming year. 5. Comparing myself to others. As Lara said, "comparison isn't just the thief of joy, it's the thief of everything." 6. Choosing goals that became more things to do. Trying to come up with a better way to choose and write goals that are meaningful, things that center and focus my life rather than adding to my schedule. 7. Consistent exercise schedule. It's always the first thing to go when things get busy. I walk to school most days (a mile each way) but I want to find a more consistent time to exercise in addition to that a few times per week. I really have so much to be grateful for. 2013 was a good year, a fun year. I am ever grateful for God's "immortal love, forever full" (one of my favorite hymn texts) and His grace that covers all. I am so grateful to be married to SD and for the blessing of our marriage. I am humbled by the people I work with at Eastman and am honored to be part of such a community. Y'all, I love our little neighborhood - our daily walks (when it's not 5 degrees outside), cozy restaurants with waitresses that know what we want before we order, and happy hours on the roof overlooking the city. I am grateful for people who truly listen and love extravagantly. I am grateful for opportunities to make music and share it with others in meaningful ways. I am humbled by the ways God provides for us. I love our everyday adventures and the joy that we find in the little things. I am thankful for intentional rest and quiet days to be home. I am grateful for opportunities to do new things with SD (like bowling!). I am grateful for the promise that each new day holds because of His great faithfulness. We went skiing in Utah with SD's family right after the New Year. Highlights include part skiing/part walking down an Olympic Women's Downhill trail (I thought I might die), learning to ride the Poma lift, and seeing a tiger at the zoo. We spent a weekend in Lewiston, NY and took a day trip to Niagara Falls (don't let our smiling faces fool you - it was freeeezing!). We organized a concert at church in April called "The Art of Song: Musical Pairs". SD and I performed two settings of "Mondnacht" (Schumann and Brahms) and we invited a few friends of ours to choose, present, and perform a pair of songs that had something in common (composer, text, theme, melodic material). To tie the whole thing together, we played our game of "Musical Memory" (first seen in the 2011 WCMW!). Great fun! We attended many of Rochester's festivals this year - the Lilac Festival, the Xerox Rochester International Jazz Festival, the Corn Hill Arts Festival, the Festival on the Green, the Park Ave Summer Arts Festival (on our street! ), the Rochester Fringe Festival, and the Hilton Apple Festival (with the largest apple crisp I've ever seen - 5' in diameter!). We played music together, cooked together, and vacationed together this summer and enjoyed many-a #weekendadventure. One of the highlights was our week at Lake J with dear friends. Here we are cooking dinner on the grill one night (I actually just stepped in for the photo - the boys were the real chefs!). We also enjoyed our share of barbecue, fried green tomatoes, and hush puppies. I presented a research poster at the National Conference on Keyboard Pedagogy outside of Chicago in July - it was my first time in the city! We shared spontaneous dinners out at our favorite places (like the above picture snapped one summer evening at Frog Pond), leisurely strolls through the neighborhood at dusk, and lots of time up on the roof (watching the city fireworks show on the 4th of July was definitely a highlight!). We traveled around New England, ate lobster, saw the horses race at Saratoga Springs, and went apple-picking (followed by an afternoon of pie-baking!). We became the Interim Handbell Choir directors at church and led a group of seven (ages 9-81!) for a fun six-week session with everything from how to pick up a bell to playing together in worship (read more about our adventures here, here, and here). My parents came up for a weekend visit in November. We were all thrilled to attend a performance of SD's new wind/film consortium project, "This World Alive"! Somebody may have turned 30 this year. Just sayin'. We spent Thanksgiving in CT (SD's parents hosted dinner for the first time this year - we were responsible for the stuffing, cranberry-orange relish, and corn pudding). On Friday, we drove down to NJ to visit my grandparents and spread a little Christmas cheer. We spent Christmas in VT (including a brief walk through our favorite town - Woodstock) and enjoyed seeing both sides of SD's family. We took a day trip into the big city with SD's parents and brother to see "Once" (amazing! ), M&M World, the big tree, and the original P.J. Clarke's (in that order). 2013 - the year that brought me new professional and teaching opportunities, the year SD received not one but two letters of acceptance from publishers, the year I learned how to make deviled eggs, the year the President stopped and had lunch across the street from our apartment building, and the year I learned (again) that I really am a terrible bowler. 1. Be specific. 2. Have a timeline. 3. Own them. 4. Measure them. 5. Write them down. I spent a few days mulling everything over, sketching out some initial thoughts, and then finding ways to make them measurable and meaningful. Boy is it tempting to turn this into another to-do list! A word of advice if you're working through the process yourself: Your goals should mean something to you. Good goals should inspire you to take action. Think about those things you wrote down in your vision. Is there a discrepancy between the life you're living now and the life you want to live? Start there. 1. I want to stay healthy and get more physically fit this year. I want to run 2-3 times per week with SD and increase our route from 1 mile to 2 miles once per week. 2. I want to find ways to give to others each month because it's a way of serving those in need and making love into an action word. 3. I want to make more time for pleasure reading (this ties in with goal #6) because it's a way of being intentional with rest, it encourages me to focus on what matters, and it inspires me to make better business decisions. This year, I want to read six new books in twelve months. 4. I want to study the Word actively because it is wisdom, Truth, and inspiration for my life and it strengthens my faith. 5. I want to be more intentional with starting my workday on time and being productive during working hours. Starting this week, I want to get up at 7:30 a.m. six out of seven days a week. 6. I want to be intentional with rest because it will allow me to take a step back and refocus, it will inspire my work, and it will make me more productive during working hours. 7. I want to live a life of gratitude all year long - not just during the month of November. I want to start this year by making a list of things that we are grateful for to display in our home. I think this will be a powerful reminder to focus on the things that matter most and to count our blessings every day. 8. Going along with goal #7, I want to focus on inspiring influences and purge negativity from things like my Facebook newsfeed and my blog reader. I want to focus on the positive and things that will inspire my work, not detract from it. I want to learn from others rather than comparing myself to others. I want to feel more content. 9. In 2012, we started buying almond milk instead of regular milk, organic eggs instead of regular eggs, and we started eating more vegetables in place of meat. This year, I want to eat more whole foods because it will keep us healthy, it will give us more energy during the day, and it goes hand-in-hand with goal #1. 10. I want to find ways to add value to others - to make an impact. I want to give and invest and encourage this year. 1. I want 2013 to be the year I get published (or at least get something in the queue). This not only will move me forward in my degree but it's a way to share my research with others in the field of Music Education. 2. Goals #2 and #3 are somewhat related - I want to become a better musician in 2013 than I was in 2012. I want to write a hymn arrangement this year and make good use of my keyboard skills class because I know it will inspire my creativity and make me a better listener. 3. I want to get back to my instrument and spend more time in the practice room. I want to become a better improviser. I want to sightread and sightsing on a more regular basis. I want to learn five songs in twelve different keys. 4. I want to create a blog schedule so I can be more consistent with my writing. I want to be authentic, share creativity, and build relationships this year. 5. I want to make a few mini updates to my website because I want it to grow and change with me throughout the year and reflect the things that I am currently doing. This list inspires me to GO and DO (unlike a to-do list, which I admit is often met with dread). In these final days of holiday vacation, I'm working on the step-by-step process for making each of these goals happen this year - with a timeline. 2013, let's do this! "Things that matter most must never be at the mercy of things that matter least." Y'all, thank you for sharing such encouraging responses to my last post! I have been so inspired by this goal-setting process this week - I can't wait to apply these steps to aspects of my professional work. Content, grateful, and present. Gracious. Saying "yes" to things that matter and basing my priorities and decisions on that. Doing more of what fires me up! Giving freely. Making love an action word. Speaking with intention. Working with passion and living a life of gratitude, love, and grace. This was the most reflective step for me. These questions really make you stop, think, and evaluate your life in a whole new way. What is important in the long run? What kind of person do you want to be? I found I really had to quiet myself for this part of the process. What a wonderful way to prepare your heart and mind for the New Year! Steps 7 and 8 are designed to keep you accountable for living your vision this year: Make a list of things you are saying NO to this year (because they detract from your vision or keep you from being the person you want to be) and make a list of things you are saying YES to this year (because they support your vision). Everything seemed amazingly clear to me after I made these lists - I even refined my vision statement. Have you ever taken the time to vocalize or write out the things that you want less of in your life? It's freeing, friends. Do what matters and forget the rest. I'm going to post these lists above my desk so that I can be reminded of them every day. Step 9? Review Steps 1-8. Refine things, add to or change things on your lists, get feedback from someone close to you. Make a note of any key ideas/goals that emerge as you do this. 1. Will this goal help my 2013 Vision? 2. Does this goal also help other people? 3. WHY would I spend my time on this goal? Write out your answer next to your goal. I love this. I'll be sharing my progress on this last step and my list of goals for 2013 with you later this week! Happy New Year, friends! As I write this, I'm 38,000 feet in the air in Delta seat 42A headed to Utah for a Danyew family ski trip (my first!). We've had a wonderful holiday adventure so far, including three Christmases, three states, and a harrowing six-hour trip (that should have taken two) in the midst of Winter Storm Euclid. You could say that we're making the most of the holidays/Winter Break. 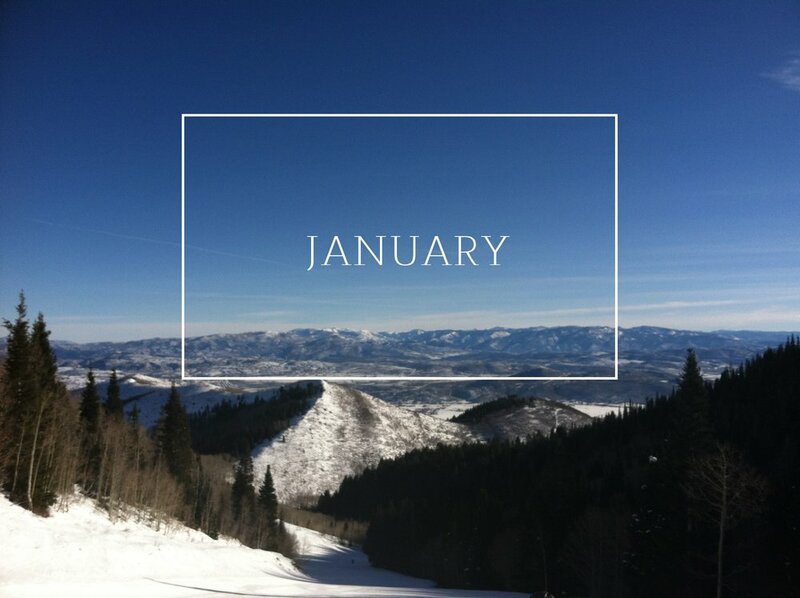 In between all the traveling, skiing, and butter cookie-eating, I've been reflecting on 2012 and setting goals for 2013. Don't you just love this time of the year? I do. Everything feels fresh and new with the calendar change and though I'm not one for making resolutions, planning thoughtful, meaningful goals and setting up ways to achieve them fires me up to live the life I want to live and do my work with passion. Raise your hand if you've jotted down a short list of goals at the last possible moment on New Year's Eve (in order to make the magical January 1st deadline). Raises hand. When you look back, how many of those goals did you accomplish? How many moved you forward? No more! I want to set authentic, purposeful goals that I can actually attain. Basically, this comes down to three points (skipping ahead to Step 4): 1. Never stop learning. Be honest and authentic in what you do. 2. Continue striving for musical excellence. Share this with others. 3. Work to live. Set boundaries, know your priorities, and focus on what matters. Again, three basic points (Step 5): 1. Invest yourself in your priorities. Give with intention. 2. Do more of what fires you up. Be inspired. Take time to rest and be filled. 3. Give thanks and be grateful every day. Step 3 is making a list of what inspires you, invigorates you, and fires you up. Make a Pinterest board for inspiration and to keep yourself on track this year - see mine here (in progress!). Y'all, this was eye-opening for me. There it is, in black and white, exactly where I am today, how far I came in the last year, and the things that inspire me most. Amazing! Now I can begin thinking ahead with purpose (Step 6). Where do I see myself in 50 years? Why do I do what I do? What is my vision? I spent a little time during the flight reflecting on these questions and sketching out my initial responses. More to come as I continue the refining process. In the meantime, please feel free to share your goals for 2013 (if you have them already) and/or your reflection on what went well/not so well this past year in the comments below. Looking forward to sharing more of my goal-setting process with you in the days to come!